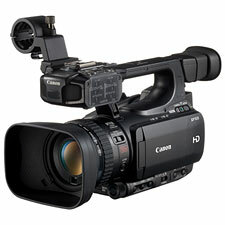 I understand Canon's XF100 is currently one of the hotter camcorders in the compact pro market, and I understand why. But to my eye, the XF100 is compromised by the limitations of its sensor, which overshadows the XF100's otherwise-impressive features. What's good about the Canon XF100? Well, it's hard to know where to begin. For starters the XF100 gives us a reasonably light and compact body (4.8 x 5.8 x 9.8" w/o lens hood) packed with pro-grade features inside and out. The XF100 is a masterpiece when it comes to effortlessly shifting between manual and automatic modes via intelligently placed physical controls and buttons on the body complemented (rather than replaced) by well-designed virtual controls and menus. Large handles may struggle a bit with all these buttons, but you can easily lock everything to prevent inadvertent changes. But control does not end with the superficial: the XF100 permits users to dive right into the guts of the imaging engine, customizing gamma, tone curve, pedestal (blacks), color, creating and saving custom profiles, and shifting between them as needed. You also get a switchable internal ND filter, negative gain settings, time-lapse settings...in short, you get a wealth of professional features all packed into one small body. And we haven't even gotten to the XF100's codec: no AVCHD here. Instead, we get 50Mbps 4:2:2 color-sampled MPEG-2, a robust and data-rich stream that exceeds broadcast quality requirements, permitting enhanced editing latitude. As I say, I understand why XF100's sell out as soon as stores get a new batch of them. But at some point, you're going to start eyeing the XF100's footage, and maybe even comparing it to its (much less expensive) consumer and prosumer peers, and that's the moment when the XF100's sensor is going to bite you. The XF100 uses the same sensor as Canon's XA10, which is in turn the same sensor found in Canon's consumer-level G10. This is a native HD sensor, meaning it has 1920x1080 pixels, so the camera's capture resolution exactly matches the output resolution (your tv screen). Ordinarily a one-to-one relationship is good, as it prevents scaling and aliasing errors, but the critical factor here is that the sensor captures monochromatic data: it doesn't read scenes in color. Unlike the XF100's big brother, the XF300, which uses 3 native-HD chips to record each color channel, the XF100 uses only one chip, rendering color via Bayer Interpolation. 3-chip cameras give us the picture we've come to expect of broadcast quality video. 1-chip-native cameras give us the XF100's picture, which compares poorly, it must be said, to many of today's best consumer camcorders. Are the XF100's superior controls and features enough to justify the less-than-stellar picture quality? Probably yes, for some shooters, but most certainly no for others. Remember, DSLR video has its own picture issues (softness and aliasing chief among them), but with DSLRs you're getting something valuable in return: stellar glass quality, shallow depth of field, extraordinary low-light performance. With the XF100, you will struggle to keep the camera happy, working diligently to stay within the narrow range of lighting conditions that the camera likes best, and for your troubles you will still get a noisy picture in bright daylight that completely falls apart as the light dims. And Heaven help you if you start looking at the same scenes shot with consumer cams costing 1/3 as much.